From From Wikipedia: This is a shorebird of the lapwing subfamily that occurs contiguously from the Red Sea coast of Somalia to southern and southwestern Africa. It is an adaptable and numerous species, with bold and noisy habits. It is related to the more localized Black-winged and Senegal Lapwings, with which it shares some plumage characteristics. 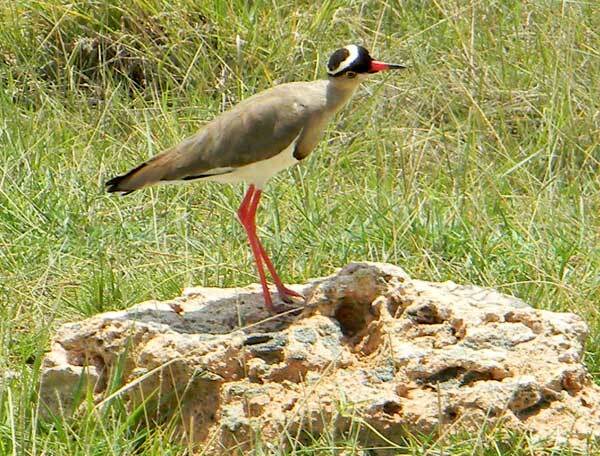 The Crowned Lapwing is easily recognized by its combination of brown and white colours, with most tellingly, a black crown intersected by an annular white halo. Adults are noisy and conspicuous. Males measure on average 3% larger than females. Juveniles are dull versions of adults, vermiculated on the wings and mantle, the legs yellowy rather than red and the bill lacking the red base. Copyright Michael J. Plagens, Page created 23 June 2012.